By all accounts Erin Donohue is wildly popular in her hometown and throughout the New Jersey running community. Consider when you ask an athlete how many state championships they won in high school, most can tell you very quickly. Erin has to figure it out - and it takes a while. Including group (school size) championships and the Meet of Champions, where all school sizes are combined, she won a staggering 33 state titles – 19 of which were at the Meet of Champions. With that stat in hand it shouldn’t be surprising to learn she never lost a race in outdoor track in the 800 on up in New Jersey from her freshman year through her senior season at Haddonfield Memorial High School. Her high school career included three national mile championships – two outdoor and one indoor. To emphasize what kind of athlete she is, she placed second at nationals in the javelin twice – an event she took up one day at practice while, “messing around with the javelin” her freshman year. Erin started running simply because, “I wanted to be like Dad.” Her father was a competitive runner and at three years old she started feeling that way as she watched him go for a run. You can find road race results with her listed when she was only six! After high school she chose to go to North Carolina for a bunch of reasons including the beautiful campus, the warmer climate and the fact that there were many top-notch academic programs to choose from. It couldn’t have hurt that Shalane Flanagan, the current American record holder in the 5000 and 10,000, was her host during her official visit. While at Carolina she was a 7-time All American and improved her 1500 time to 4:14.57. Erin graduated in 2005 with a B.S. in Business Administration with a concentration in marketing. Although she had a stellar college running career it was post-collegiately where she improved dramatically. 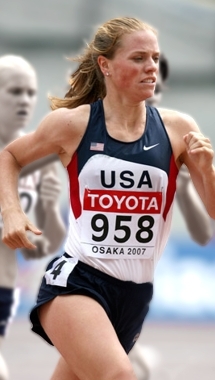 Just two years after graduation she placed third at the 2007 U.S. Championships in the 1500 which earned her a trip to the World Championships in Osaka, Japan. The following year she placed second at the Olympic Trials fulfilling her dream of becoming an Olympian. This year she improved her 1500 time to 4:05.21 at the Athens GP on July 13.